Successful people, and happy people have one thing in common....they envision their life in a positive way! And they end their day on a good note! Join Ilona Selke to create your life from the INSIDE OUT! Join Ilona Selke in daily short guided imagery exercises so you too can start your day right and end your day on a good note. In just three days you will start to feel the positive effects on your life. Ilona Selke is an internationally bestselling author, seminar leader, lecturer, musician and CEO/co-founder of Living from Vision. to discover the power of their consciousness and how to create a successful life. offers real-life stories of transformation as well as practical tips anyone can use to shapeshift their lives from the inside out. Have you ever thought that we might be living in a holographic or virtual reality? Have you ever watched your thoughts manifest in 3-D reality? DREAM BIG - the Universe Is Listening takes you on a journey into the greater mystery of the holographic nature of the universe. Learn step by step how to manifest your goals and wishes as you realise, that we are actually living in a consciousness interactive universe! For you to become the master of your destiny, you need to dive into your subconscious and reach into your super-conscious. Travel with Ilona Selke across the globe, and into new levels of consciousness, as she describes in easy to follow steps, just how magical life really is and much the universe is listeing. You will come away inspired and equipped to make your dreams come true and live in your Heaven on Earth. ...Learn more about LIVING FROM VISION. 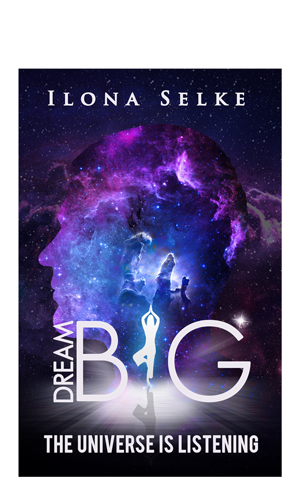 ... Let Ilona Selke teach you how train your mind to make your dreams come true.